Read anywhere, anytime. Subscribers to the Quarterly Essay have full digital access on the website as well as on the iPhone/iPad and Android apps. Every issue of the Quarterly Essay is available online – that’s nearly 60 editions and 1,450,000 words of agenda setting literature. 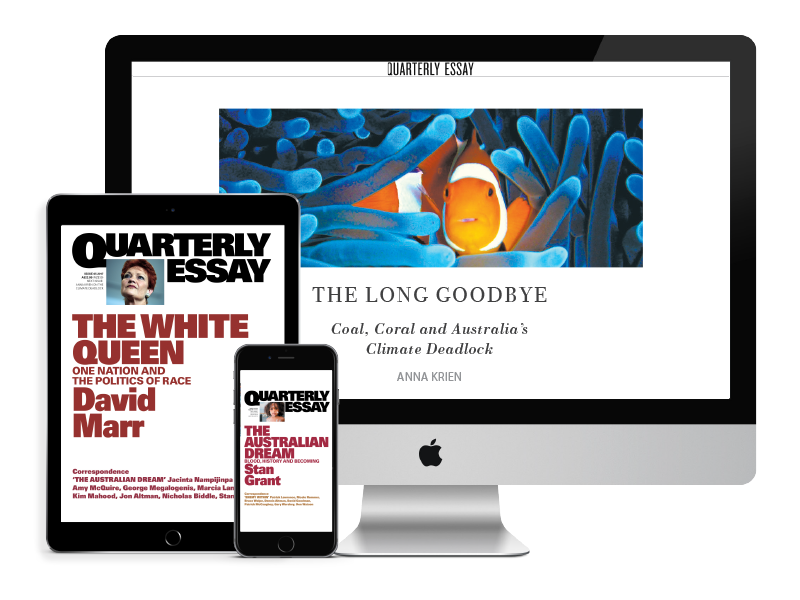 Quarterly Essay is an essential online resource for anyone interested in Australian literature, politics, culture and debate, one that will continue to expand as each new essay is published. When you purchased your subscription, an online Schwartz Media account was created for you. This account can be used to manage subscriptions to the Quarterly Essay. People who subscribe to the Quarterly Essay, the Monthly and The Saturday Paper should use the same username and password to log in to these websites. Your username is the email address you provided when you set up your subscription. If you subscribed online, you would have created a password; if you subscribed over the phone, a password would have been given to you. Sign in to your account to manage your subscription. You will need to sign in to the website every time you visit, and the app every time you wish to download a new issue. Each issue of the Quarterly Essay will be available to view online and to download via the app on the date of publication. The Quarterly Essay app is available free from the iTunes App Store and the Google Play App Store. 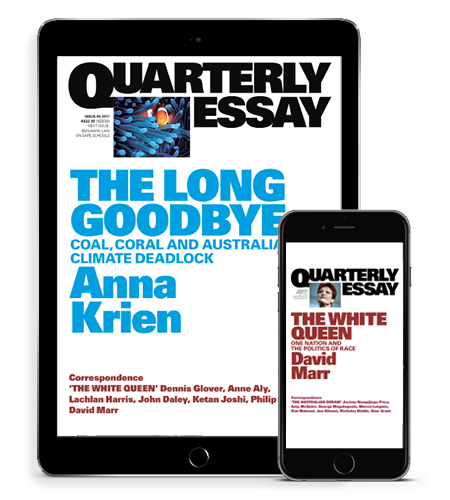 Once you have downloaded the app to your iPad, iPhone or Android device, you can use it to download each issue of Quarterly Essay to read offline. Your app will also store issues that you have previously downloaded. The app will not automatically download each issue. You will need to log in using your username and password to download the latest issue. For any subscription questions, or problems logging in, please email our subscriptions team on [email protected] or call 1800 077 514 (free call, Australia-wide) or 03 9486 0211. The subscriptions office is open Monday to Friday, 9am to 5pm AEST. Q. Is Quarterly Essay available on mobile and tablet devices? A. Yes, we have an app for smartphones and tablets. Download the app to read Quarterly Essay anytime, anywhere, on a wide range of devices. Our app is designed for reading offline once issues have been downloaded to your device. Q. How do I download the Quarterly Essay app? Q: How do I get digital access? Your username is the email address you provided when you set up your subscription. If you subscribed online, you would have created a password; if you subscribed over the phone, a password would have been given to you. If you have forgotten your password, click here and follow the prompts. Q: What do I do if I've forgotten my password? A. If you have forgotten your password, click here and follow the prompts. Q: How do I log in to the website, or app? A: To read Quarterly Essay on our website, log in here. In the app, you will be prompted to log in using your Schwartz Media account username and password. Q: How do I read an essay on the website? A: To read Quarterly Essay on our website, log in, then navigate to the Essays page and click on the Read Essay button. Or navigate to the essay you want to read, and click on the Read Essay button. Q. What should I do if my Quarterly Essay app crashes? A. For the best performance, please shut down any other apps running in the background. If problems persist, force-quit the app, then reopen it. If you’re still having trouble, try turning your device off and then turning it back on. You can also try deleting and reinstalling the app. And if none of that works, please let us know by calling (03) 9486 0288 (Monday to Friday 9am to 5pm AEST). Q. What do I do if I can't login to the Quarterly Essay app. A. After first installing the app, it may take several minutes for your device to establish a connection with our server. If the login and/or account page appear to be blank, please allow up to three minutes for this page to load. We are currently working on optimising this experience. If you are still having problems, please try closing and reopening the app. If you continue to have problems logging in, please email our subscriptions team on [email protected] or call 1800 077 514 (free call, Australia-wide) or 03 9486 0211. The subscriptions office is open Monday to Friday 9am to 5pm AEST. Q. Which browsers work best for viewing quarterlyessay.com? A. For the best results, use a popular browser (such as Chrome, Firefox, Safari), updated to the latest version. Q. How do I search for keywords on quarterlyessay.com? A. Hit Search in the top toolbar, then type in your search term. Q. Can I access back issues of Quarterly Essay? A. Every issue of the Quarterly Essay is available to our subscribers. If you are not a subscriber, you can purchase single issues through our app. Q. Can I buy single issues through the app? A. Yes, you can purchase single issues through our app. If you are a subscriber, every issue of Quarterly Essay will be available to you. Q. Are printed back issues available? A. Yes, browse our online store for printed back issues. Q. How do I find my subscriber number? We need to verify your account details over the phone to provide you with your subscriber number. Please call (03) 9486 0288 (Monday to Friday: 9am to 5pm AEST).